Hey lovies! I'm so happy to post a book review about Doodletopia: Fairies. I am a huge fan of Christopher Hart, although the images are slightly different in this book than his other ones. His illustrations are just amazing and the way he teaches are not only easy to follow with his instructions but they are completely doable. My daughter and I have purchase quite a few drawing books and we are always drawn back to Chris' books. I'm pretty sure we have every book he's ever written just because his teaching style is so clear and direct. The step by step instructions make it easy to incorporate into your own drawings and once you've gotten the hang of it you can venture into your own style. Something that is encouraged from Christopher's books. My daughter is thirteen years old and she has loved following the steps in this book. I've also enjoyed trying my hand at these drawing. I have a few of them posted on my instagram account. Look at how adorable these little fairies are! AH LOVE THEM. I am so grateful to have been given a complimentary copy to review this book, through blogging for books, for my honest opinion. Update on where I've been: Accepted into Nursing School! Hey lovely world! I've been gone for a while. I actually forgot how to sign onto blogger, no I'm not joking I spaced it. So here I am in a little desk set up by my amazing husband looking at notes on my white board that use to overwhelm me. I'm in a bit of a different space so to speak. I've decided to get back into posting on here. More for me though and my kids and you if you happen to find the content interesting or helpful to you. I've experienced such a shift in my life over the last couple of years and I am so grateful for all the opportunities bestowed upon me in the past and in the present. I'd like to keep all of the craft related posts and just keep going from there. Although I don't get to sit down with paper too much these days I do find it makes my heart happy to decorate my planner. I also decorate my notes for school the best I can. I'll share all of that here. Nothing fancy but it's my little piece of happy. About a year ago I decided I wanted to go back to school to pursue my dream of becoming a nurse. I thought at the time that I was so close to my goals; in retrospect I wasn't. Deciding to take it one day at a time I registered for two classes my first semester back. I hadn't attended college in over nine years. YEAH I know, to say the words seems like such a long time. To be honest it all started with the thought that if I took the time I could learn a new language every five years. If I did that I could potentially learn 10 new languages by the time I'm 80. But I digress. So with my backpack in tow I ventured out into the world of university studies. I decided because of my full-time work schedule and having three kiddos at home one online class and one physical class would be more than enough for me. Looking back I wish I would have taken two physical classes. For the physical class I received an A, for the online class a C. I don't thrive in online classes, something I hope to remedy over the next five years. The second semester I took three classes and aced all three. I was pretty damn proud of myself although it was the summer term (shorter) and I didn't have to work as much because at the time I was working at a High School. Fast forward to today. 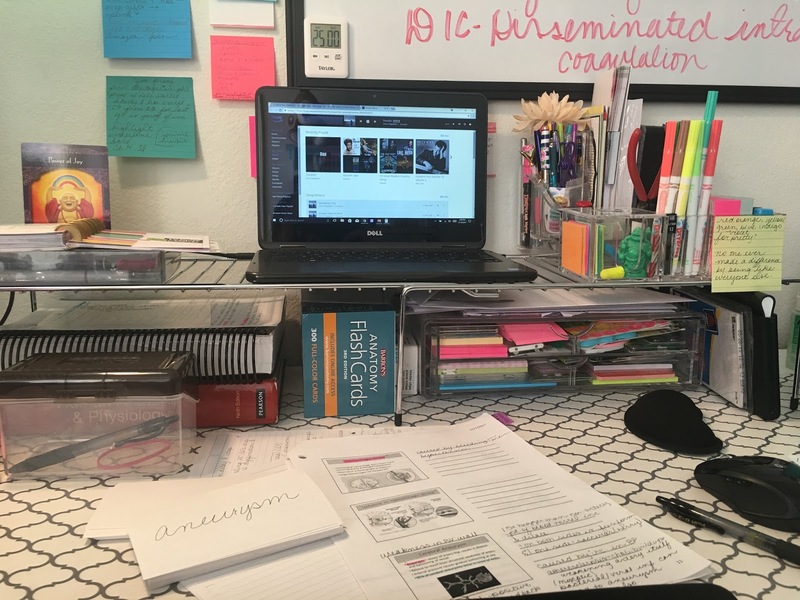 I'm currently in my last two classes Pathophysiology I and Anatomy & Physiology II before the Nursing program. I'm doing pretty well although I've left my full time job and now I just work part-time. I've passed the Hesi, I'll talk more about this later, and I've been accepted into the Spring 2018 Nursing Program. I'm pretty flippin excited! The kids are excited, the hubs is excited. It's not that all of this has come easy or quickly because honestly it hasn't. It's come almost 10 years after I'd have liked it to. I've realized something though. I've realized that things don't happen on our time. They happen on Gods time. Although it would have been great to have my degree 10 years ago my kids would have never seen it. The dedication and the struggle and the failures and the successes. The fact that my husband has helped with laundry and dishes and doesn't complain one bit if I have to study for an exam or a quiz. The kids know that when I tell them they are capable of great things it's not because I believe that it will always come easy. It's more so a knowledge that if you try your absolute best and bust your hump you are capable of doing great things. The kids tell me everyday how proud of me they are. I wonder if that would be the case if they were never to see me struggle. To cry and get frustrated about a subject. If they were never to see me watch a youtube video over and over just to understand a concept. We have a saying in our house, "if someone asks you for help you never say, 'oh that's easy'" because my friend, if it were easy I never would have asked you for help or asked you to explain it to me. So as I think about this post I just want YOU to know that it is never too late. It's never too late to do the things that you feel in your heart you are meant to do. Go out there and be amazing. Be better than amazing! Shine and do something wonderful with one short and precious life. Hey beautifuls! I am so excited to bring you another book review and this is one that is very near and dear to my heart. I've been a clothes hoarder for my entire adult life. I'm going to admit that I've been this way ever since I started making money. My biggest expense was probably clothes. Once I started having kids I realized my clothes shopping was out of control! I mean out of control. About two years ago I got into a method that I really liked and that is very popular. Basically it discusses reducing the amount of "stuff" you have and being able to organize it appropriately. Well that encouraged our entire family to get rid of quite a bit. Unfortunately, it didn't assist me in honing my style. So I went to pinterest which is the holy grail of anything. Well this didn't help me figure out my style but it did help me find out that I wanted to be a minimalist. This, my friends, is easier said than done! So let's jump to 2016 and this beautiful book and I'll walk you through why I loved reading it so. Basically, this book is a workbook. It guides you step by step in finding what works for you and what doesn't work for you. I was able to create an effective wardrobe that I am so very proud of. I'm able to mix and match patterns and accessories that I had trouble pairing prior to reading this book. This book includes tips, tricks, must haves, mistakes, successes, habits, and most importantly step by step instructions. This would be an amazing Christmas or birthday gift for literally anyone. I think men and women of all ages can benefit from reading this book. I strongly recommend it. Thank you so much to bloggingforbooks.com for allowing me to review this book for my honest review. 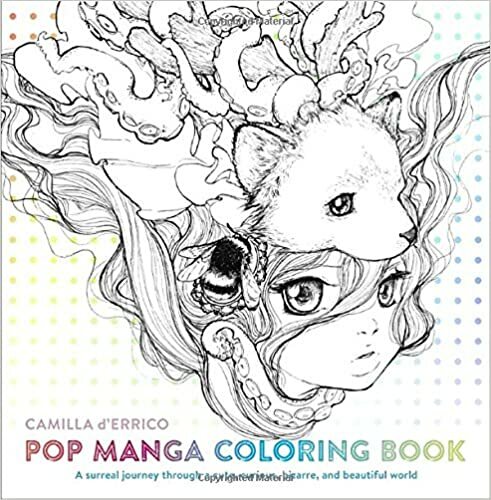 Book Review~ Pop Manga Coloring Book<-----Seriously, you NEED this one! I had to post a large picture of this review because honestly..."THAT COVER". My oldest daughter is into Manga and her and I have been on the "adult coloring" bandwagon for over a year now so when I saw this beauty we just had to get it. Have you ever seen the cover and pretty much sight unseen knew you were going to enjoy the content so much? 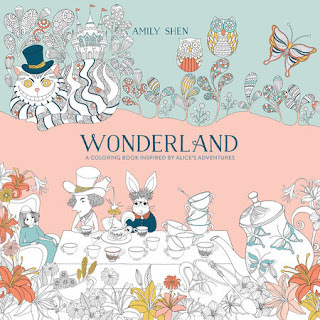 This book illustrated by Camilla d'Errico is just that. Her illustrations are works of art that fascinate the mind. So let me go over this little gem and tell you the pros and cons from my perspective. Pro 1. The illustrations are on point. The way her mind transforms an image from one main focal point to multiple themes reminds me of having fun in elementary school while I was working on Squiggles. Do you remember those? The teacher would draw a random shape on your paper and you had to turn it into something. Even though my squiggles never looked near as good as these the whimsical feel is the same. Just look at the main cover we have a beautiful little girl with a bee in her hair and her neck is wrapped by an octopus that looks like it is wrapped around sea wood, and then to top it all off she is wearing a bear on her head. YEAH Adorbs! Pro 2. You feel as though you were just given d'ERRICO's art journal. Some pages look as though they were drawn with charcoal which is thicker and choppy. It is my absolute favorite medium and I adore these pages. However, there are some amazing pages that are drawn with (what looks like) pencil and they are just as beautiful. Most of these pieces are reminiscent of walking through an art museum. You can FEEL the emotions of each scene. They are truly beautiful. Pro 3. The cover it quite thick which makes a great base for a book that you will be coloring in. Pro 4. You could learn how to really draw with this book. d'ERRICO's hand strokes are effortless to follow and so beautiful to see on paper. Con 1. The book is an odd shape (large, for a coloring book) which is completely fine if you are coloring on a coffee table or desk but large otherwise. Con 2. You don't really want to color the pictures they are so beautiful. I wasn't sure if this fit under a pro or a con but I can see it as both so there ya go! This was a super amazing book to review from Bloggingforbooks.com and we are so grateful that we can share our honest opinions with you. Hey lovies! 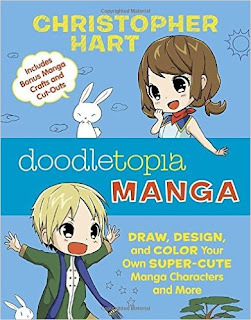 I'm so happy to post a book review about Doodletopia: Manga. I am one of the biggest fans of Christopher Hart. His illustrations are just amazing and the way he teaches are not only easy with his instructions but they are completely doable. My daughter and I have purchase quite a few drawing books and we are always drawn back to Chris' books. Each illustration comes with roughly four steps that one simply follows to obtain a similar images. Not only are the facial images adorable but the clothing and hair on each character is so sweet as well. My daughter is twelve years old and she has had her artistic abilities strengthened by following the steps in this book. At first she began by tracing the finished image. From there she began going backwards and doing the steps. I know that may be a different approach but it has greatly worked for her. We both especially loved the extras that are in the back of the book. The bookmarks are our faves. We've been road tripping and enjoying our summer over here and I couldn't think of a book that I pack more than this little gem. 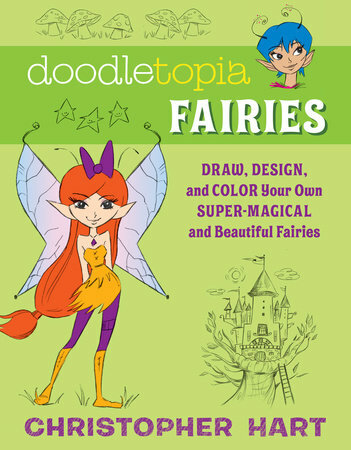 The kids and I are always drawn to this book for coloring to help us de-stress and relax during those long drives. It actually sits in our car with a pack of colored pencils. The pages are so beautiful and they absorb color so well. Each design is unique and creatively sequences some of the best scenes from Wonderland. We are giant fans of The Mad Hatter in this house and the illustration for this guy is so adorable in this one. The natural elements are also very beautiful tiny details as well as larger images. This makes it so nice because it spans a large age gap and the kids and I are able to color together. We are so grateful to have received this book from Bloggingforbooks.com in order to review it. ~Also, watch for a new (super easy) giveaway! Hey y'all. We are so grateful for the support we've received over the last three months. Just last month in March we started doing a monthly giveaway. 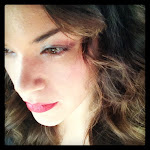 Please take a look to see what this months new giveaway is and for your way to qualify. Y'all, are any of you super into hair and makeup? Yeah no, me either. I'm gonna be honest and tell you that I can rock a bun and sweat pants and call it good. But, I have daughters; gasp! Yup and one is just like me and the other, not so much. She is constantly watching YouTube videos and trying to figure out how to do new styles. Essentially I decided to request this book to review from Bloggingforbooks.com for her. It would be a win, win she could read it do her hair and the world would be at peace again and maybe I could get my ipad back. Well I was enthralled. I opened the book and learned quite a few things that I hadn't ever seen before. 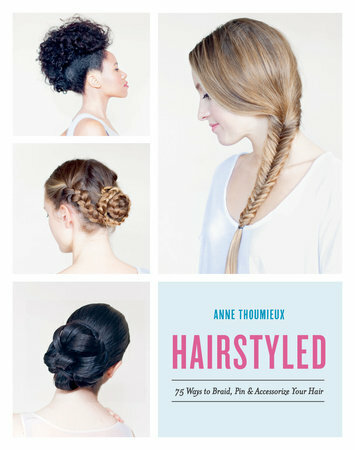 I'm all for easy and fast way to get ready and this book made some beautiful hair styles look fast and easy. So of course I had to try them out because we've done a few hair styles in our home that were advertised as "fast and easy" but the phrase false advertising doesn't even begin to cover it. We were able to mark pages that we wanted to go back to and flip through in the morning before school to get creative ideas. This book is so great and I love the example pictures. Positives: I personally have curly hair. It's not the easiest to find cute curly hairstyles and this book did focus on curly hair. Having it's own section made it easy to bookmark so that I can easily go to that section. I do straighten my hair on occasion so it was nice to see all of the straight hairstyles as well; it was a good balance. Great table book as well. I'm grateful to bloggingforbooks.com for being able to receive this book for my honest review. We have some awesome stuff in the works. We can't even begin to tell y'all how excited we are!! !